Leith, North Dakota. Population 16 according to the U.S. 2010 Census. Right smack in the middle of Grant County, it does not seem like a place worth noting. Yet it is now very much in the news. 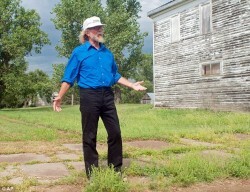 In 2012, the white nationalist (read: racist) Craig Cobb began to buy land in Leith. His purpose is to buy land plots so that he can give the land to neo-nazis and Ku Klux Klan members. Cobb’s ultimate goal is to create an “all-white” community of like-minded people. He has been joined in his plan by fellow white nationalists April Gaede and Jeff Schoep. Schoep has brought members of his National Socialist Movement to Leith on a “fact-finding” tour to help create such a community. Almost all of Leith is white non-Hispanic. The exception is a mixed race family that is terrified of the prospect of neo-nazis and Klan living right next door to them. In fact, all of the long-time residents of Leith are terrified of the neo-nazis and Ku Klux Klan. Whatever their race, the long-time residents of Leith do not want their community turned into an extremist enclave filled with possible violence and hatred. Some of the Leith residents have called for the dissolution of the town and having it absorbed by Grant County to prevent what can only be seen as a neo-nazi takeover. Personally, I cannot blame them. If my town were about to be taken over by an extremist group bent on creating some insane ideal community of fanatical followers, I too would find some legal way of stopping it. One thing I can be sure of, and that is Leith will only be the first of Lord knows how many other such communities that some extremist right wing racist groups will try to create. If they successfully create one in Leith, it will be a blueprint for other such neo-nazi communities. If they fail, they will most certainly try somewhere else. Having a neo-nazi or Klan neighbor is scary enough, but having a whole community is just positively insane. Since buying land is not illegal, there does not seem to be much the long-time residents of Leith can do about it. I can well understand why there is a great deal of fear in Leith these days.